With a student population of over 38,000, Texas State University is an Emerging Research and Hispanic-Serving University located in the burgeoning Austin-San Antonio corridor. Founded in 1899 and currently the 16th largest public institution in the United States in terms of undergraduate enrollment, Texas State enrolls students from all 50 states, the District of Columbia, and 66 countries. Students choose from 98 undergraduate, 90 master’s, and 12 doctoral programs offered by ten colleges (Applied Arts, the Emmett and Miriam McCoy College of Business Administration, Education, Fine Arts and Communication, Health Professions, Honors, Liberal Arts, Science and Engineering, the Graduate College, and the University College). With a diverse campus community, including just over 50 percent of the student body from ethnic minorities, Texas State is one of the top 14 producers of Hispanic baccalaureate graduates in the nation. Ideally situated on almost 600 acres across two campuses (San Marcos and Round Rock), Texas State is in the midst of the largest construction program in its history, experiencing an exciting period of growth with approximately $545 million in new construction, renovation, and expansion. The main campus in San Marcos boasts 220 buildings, including 24 campus residence halls and apartments. Reporting to the assistant vice president of student affairs/director, student diversity and inclusion and serving as a member of the student affairs leadership team, the director, disability services is responsible for operations of the office of disability services which coordinates accommodations and support services for enrolled students with disabilities at the university. The director provides the leadership and vision for the office of disability services through the development of programs, policies, and processes that provide timely and effective services for students with disabilities. In addition, this position is responsible for identifying and establishing program goals; making additions and changes to the strategic plan; compiling reports on program activities and services; developing program policies; and recommending university policies and procedures for incorporation in the university policy statements. Further, the director responds to requests for general and program information from enrolled students and potential students and their family members as well as requests or interpretation of legal mandates on campus issues related to ADA and interpreting federal law and court rulings affecting services for students with disabilities. The director provides consultation for faculty regarding instructional needs and reasonable accommodations and other campus departments regarding the needs of students with disabilities. With oversight of a $1.37 million budget and a passionate staff of 13, the director is responsible for developing and monitoring the budget as well hiring, training, supervising and evaluating all staff. The director also presents information on program services and coordinates programming activities to increase awareness of the needs and abilities of students with disabilities as well as works to collaboratively monitor the university’s self-evaluation plan for progress towards ADA compliance. The successful candidate will have a bachelor’s degree and a minimum of five years of work experience in disability services or related field. A master’s degree in counseling, education, student personnel, psychology, sociology, or related degree is preferred. The candidate must have demonstrated experience with the supervision of professional and support staff, fiscal management including budget development and oversight, strategic planning and program development. A strong familiarity with applicable state and federal laws and regulations pertaining to disabilities including the American with Disabilities Act (ADA), and the application of this act to the university setting as well as knowledge of testing, interpreting, accommodation services/programs and assistive technology, and a broad spectrum of disability services experience are required. In addition, the successful candidate will be an effective communicator including public speaking and presenting skills, and possess the ability to gather, analyze, and interpret data to make informed management decisions. Additional preferred qualifications include progressive administrative/leadership advancement; bi-lingual (Spanish) skills; experience coordinating with or responding to the Office of Civil Rights; and a minimum of three years of experience working directly with students with disabilities. Strong future-thinker and collaborator committed to advancing disability services throughout Student Affairs and the entire campus community. Deep understanding of the complexities and types of transitioning from secondary to post-secondary educational environments. An understanding and deep commitment to social justice and demonstrated cultural competence with strong belief in the value of diversity in enriching the learning experience and the quality of life on campus. Credible, engaging, supportive, and approachable supervisor with knowledge of the responsibilities of each staff member’s position, respect for their work and contributions, and proficient at advocating for staff and students, their programs, and needs. Strong personal investment in and passion for students’ wellbeing and success. Demonstrated commitment to a strong collaborative style and capacity to build bridges to departments, faculty, students, and the community to facilitate open discussions and joint ventures advancing disability services and initiatives. Compassionate, accessible, transparent, and ethical leader with excellent communication skills to clearly articulate vision, direction, and purpose and earn the respect and confidence of the faculty, staff, and students. Maintain a commitment to continual improvement and professional development by encouraging staff to be actively engaged in professional associations and alert to evolving trends and emerging best practices. Comfortable with data collection, analysis, and data-driven decision-making and the systems and assessment measures that support these processes. Excellent communication and interpersonal skills, clarity of thought, and the ability to make difficult decisions. Extensive experience in team building, innovation, budget management, employee development, and strategic planning. Demonstrated experience educating faculty, students, and the university community on the scope and functions of an office of disability services. The past director left the institution in 2016 after serving as the director for approximately three years. This director worked to move the office in a positive direction and made many improvements. After his departure, an interim director was put in place and will remain until this new director is hired. The new director will encounter the opportunities, priorities, and challenges listed below. Great opportunities exist at Texas State. The new director can help the Office of Disability Services realize its full potential and achieve amazing results. The new director has a wonderful opportunity to lead change that will have a lasting impact on students and campus culture for years. Collaborate with campus stakeholders to explore possibilities for expanding academic and learning support for students. Working to enhance the relationship between both the San Marcos and Round Rock campuses. Work to forge strong relationships with faculty and deans to enhance understanding of laws and compliance issues and collaboratively find solutions to best meet students’ needs. Continue and enhance the K-12 outreach efforts to local schools. Work to educate the Texas State community about the office, its mission, services, and functions, and encourage authentic engagement with faculty, staff, students, and the community. Promote the importance of disability services to the campus community. Review all policies and procedures ensuring all are current, relevant, and efficient. The new director must establish a vision and direction for the department with goals, expectations, and priorities that the entire office embraces. The current staff is open to change and looking for the new director to make appropriate changes to all aspects of the department within a clearly articulated and well-thought-out plan. Earn the respect of the campus community through accessibility, visibility, and transparency. Build an exemplary team through the thorough evaluation of the current staff structure, enhance current staff’s morale, and create a culture of honest information sharing and solicitation of others’ input. become a visible leader on campus who is knowledgeable on current and emerging trends and issues and how to effectively articulate them to campus stakeholders. The mission of the Office of Disability Services is to ensure that students with disabilities have equal access to all university programs and activities. We provide students the opportunity to reach their full potential by coordinating academic accommodations and support services. We help to foster a supportive and inclusive educational environment through an intersectional model that helps build and maintain partnerships across the university community. The Office of Disability Services will strive to become a model program serving students with disabilities in higher education. We are committed to developing a campus community in which individuals with disabilities thrive and participate fully. These individuals will be challenged to become responsible decision-makers, problem-solvers, and self-advocates with agency in their own education and future. We envision a campus community where all individuals are seen as valued and contributing members of society. Respect for all encompasses everything we do. In accordance with the 1990 Americans with Disabilities Act and university policy, all members of the university community are responsible for ensuring that students are not discriminated against because of a disability. To accomplish this goal, reasonable and appropriate accommodations may be necessary for physical and/or programmatic access. The ODS, in conjunction with university departments and offices, will facilitate necessary accommodations for qualified students with disabilities in the most appropriate integrated setting. The ODS provides a variety of services for enrolled students with disabilities who meet the criteria outlined in the applicable ODS disability guidelines. Specialized support services are based on the individual student’s disability-based need and are provided free of charge for qualified students with documented disabilities. In addition to serving students with disabilities at Texas State, ODS also is committed to meeting the needs of students with disabilities enrolled in classes at the Texas State University Round Rock Campus (RRC). Services for students enrolled at the RRC are coordinated by the General Disability Specialist in the One-Stop Center. The processes for accessing some services and accommodations at the RRC may differ from those described for the Texas State San Marcos campus. The ODS Student Handbook has been created to provide additional information regarding ODS policies and procedures. The ODS procedures and university policies are subject to periodic updates. Texas State’s 38,694 students choose from 97 bachelor’s, 92 master’s and 14 doctoral degree programs offered by the following colleges: Applied Arts, McCoy College of Business Administration, Education, Fine Arts and Communication, Health Professions, Liberal Arts, Science and Engineering, University College and The Graduate College. As an Emerging Research University, Texas State offers opportunities for discovery and innovation to faculty and students. Our students come from around the globe and our student body is diverse. Fifty-two percent of Texas State students are ethnic minorities. Texas State ranks 14th in the nation for total bachelor’s degrees awarded to Hispanic students. See the Facts and Data page for more information on our student body. Texas State is proud to be a tobacco-free campus. Texas State University is accredited by the Southern Association of Colleges and Schools Commission on Colleges to award baccalaureate, masters, and doctoral degrees. Contact the Southern Association of Colleges and Schools Commission on Colleges at 1866 Southern Lane, Decatur, Georgia 30033-4097, or call 404-679-4500 for questions about the accreditation of Texas State University. Texas State’s San Marcos campus is located in a growing community of 60,000 people in the Austin Metropolitan Area. Located in the Texas Hill Country, where blackland prairies roll into beautiful hills, Texas State enjoys a setting that is unique among Texas universities. The beauty of the crystal-clear San Marcos River that runs through campus and the stately cypress and oak trees on the campus add to the charm of the university’s picturesque setting. Our location on the banks of the San Marcos River provides recreational activities for students throughout the year. The Texas State Round Rock Campus is located north of Austin. Students there can take upper-level courses leading to bachelor’s degrees and complete master’s degree and certificate programs. Students who complete their degree requirements at the Round Rock Campus earn their degrees from Texas State University. Completed in 1903, the red-roofed, Victorian Gothic style Old Main was Texas State’s first building. As the university’s student population has grown — from 303 in 1903, to 38,694 in 2017 — our San Marcos campus also has expanded. Today, the campus has grown to 491 acres. Texas State has an additional 4,000 acres of academic, agricultural, research, and recreational areas. The Texas State campus is as diverse as the students who live and learn here. Our hilly grounds are home to 209 buildings. Some, like Old Main, are as old as the university itself. Others, such as the Angelina and San Gabriel residence halls, opened in 2016, and more new buildings are scheduled for completion soon. 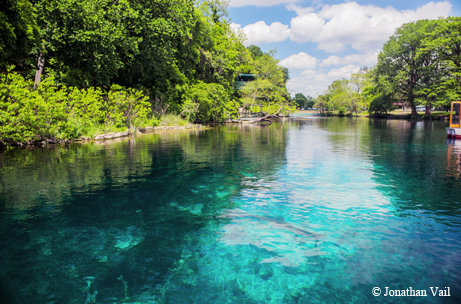 At the Meadows Center for Water and the Environment on the Texas State campus, you can see the second-largest springs in Texas through the floor of a glass-bottom boat or glass-bottom kayak. These springs feed the San Marcos River and are home to eight endangered species, including the Texas blind salamander. Our campus is one of the best places in the world to study aquatic ecosystems and species. Authorized by the Texas Legislature in 1899, Southwest Texas State Normal School opened its doors in 1903. Over the years, the Legislature broadened the institution’s scope and changed its name, in succession, to Southwest Texas State Normal College, Southwest Texas State Teachers College, Southwest Texas State College, Southwest Texas State University, and in 2003, to Texas State University. Each name reflects the university’s growth from a small teacher preparation institution to a major, multipurpose university. Texas State’s original mission was to prepare Texas public school teachers. It became renowned for carrying out this mission, but today it does far more. San Marcos enjoys the nickname “San Marvelous”, due in large part to its natural beauty, with two rivers and four creeks flowing through the city. Situated on Interstate 35 between Austin and San Antonio, San Marcos houses Texas State University, along with research facilities like the San Marcos National Fish Hatchery & Aquatic Resource Center. Residents of San Marcos enjoy generally mild winters and hot, humid summers. The San Marcos River is a popular place for tubing, canoeing, swimming, and fishing. Located between the fast-growing metros of Austin and San Antonio, the Greater San Marcos region is attracting a new generation of entrepreneurs, students, families, veterans, chefs, musicians, and artists, all looking for an ideal place to live, work, and put their own twist on what it means to be a Texan. The region’s seven major cities (San Marcos, Kyle, Buda, Dripping Springs, Wimberley, Lockhart, and Luling) each offer their own unique culture and advantages, from new real estate developments to diverse food and cultural scenes. In the heart of the “Innovation Corridor,” the San Marcos region is the perfect blend of city amenities, outdoor adventure, and Texan culture with a unique flair. Just 30 miles outside of downtown Austin, Greater San Marcos offers close access to the vibrancy of Austin but at a more affordable cost (housing prices are nearly 40 percent less than Austin). But lower cost is not a sign of slower growth. In fact, San Marcos was ranked the fastest-growing city in the U.S. from 2013-2015 by the Census Bureau, and is the county seat of Hays County, which in 2016 was ranked the fastest-growing county in the nation with a population of more than 150,000. This growth has caused some to dub the region “America’s Next Great Metropolis.” Not only does the region offer a dramatically lower cost of living, Greater San Marcos is also adding employment opportunities at a rapid rate. Amazon is one of the many companies which have taken advantage of the area’s strategic location with a fulfillment center that has created more than 3,500 jobs. Home to a new wave of restaurants and bars, the San Marcos region has everything from award-winning cocktails at Cody’s Bistro and Lounge to locally-sourced, modern fare at The Leaning Pear. Globally-inspired flavors are also plentiful at places like Palmer’s, where regional fusion is given a twist with New Mexico and New Orleans influences. If true Texas staples are what you’re looking for, the Greater San Marcos is home to both the BBQ Capital of Texas (Lockhart) and the Pie Capital of Texas (Kyle) thanks to famous local favorites like Kreuz Market, Black’s BBQ, and the Texas Pie Company. Other local San Marcos eateries of note are Garcia’s and Herbert’s Taco Hut, serving delicious Tex-Mex meals, and Gil’s Broiler, the oldest restaurant in San Marcos and known for its famous Manske rolls (their own version of cinnamon rolls), which are still made fresh daily. The region is also home to craft breweries, distilleries, and wineries, which dot the beautiful Texas Hill Country and provide our residents with a lot of options to enjoy. With Texas’s rolling hills as the region’s backdrop, the San Marcos region offers a variety of outdoor activities. Hike through one of the many trails and state parks or cool off in the 44-mile crystal clear turquoise waters of the San Marcos and Blanco Rivers, an ideal oasis for tubing, paddleboarding, kayaking, snorkeling, and swimming—with a year-round temperature of 72 degrees. Jacob’s Well and Blue Hole Regional Park are Instagram-famous, natural swimming holes and popular spots to cool down during the hot summer months. For true outdoor adventure-seekers, San Marcos hosts the annual Texas Water Safari. Billed as the “world’s toughest canoe race”, it is a four-day, 260-mile canoe race to the Texas coastline. Finding the perfect home in Greater San Marcos isn’t a headache—it’s a home buyer’s dream. You’ll find amenity-filled apartments, historic homes, and modern spaces with multiple acres of backyard at every price point (the median home price in Hays County was $255,031 in 2017). With over $2 billion in real estate investments happening in the San Marcos region right now, Trace and Plum Creek are two new master-planned communities featuring everything from athletic fields to nature parks to pools, embracing a variety of living styles to attract families and young professionals. Additionally, La Cima, a sustainability-focused, 2,000 acre master-planned community, will be one of the largest urban preserves in the U.S. with acres of permanent walkable open space and habitat lands. Kissing Tree, a new active adult development with a distinctly Texan feel offers a unique collection of indoor and outdoor amenities on the edge of the Texas Hill Country, including an 18-hole golf course. Located between two of the military’s largest bases – Fort Hood and San Antonio – Greater San Marcos’s strategic location puts the region in an ideal position to support the huge wave of veterans looking to take advantage of the post 9-11 GI Bill. As a result, San Marcos has become one of the most veteran-friendly cities in the nation, thanks to new job training programs and Texas State University, which has the largest student veteran population in the state. The region also continuously recruits companies like San Diego-based Coast Flight, which established a new training facility to help U.S. military pilots transition into civilian airline pilots for the nation’s top airlines. Many local companies in the San Marcos region are also veteran-owned, such as Desert Door Distillery, the nation’s only sotol distiller that began as a class project between three military veterans. Texas State University is a doctoral-granting, student-centered institution dedicated to excellence and innovation in teaching, research, creative expression, and service. The university strives to create new knowledge, to embrace a diversity of people and ideas, to foster cultural and economic development, and to prepare its graduates to participate fully and freely as citizens of Texas, the nation, and the world. continued reflection and evaluation to ensure that our strengths as a community always benefit those we serve. Approved by the President’s Cabinet on October 3, 2016, and revised on December 19, 2016 (approved by the Board of Regents on February 16, 2017, and by the Texas Higher Education Coordinating Board on February 24, 2017). Promote the success of all students. Offer high quality academic and education programming. Achieve significant progress in research and creative activity as measured by national standards. Provide the necessary services, resources, and infrastructure to support the university’s strategic direction. As we developed this new plan, we were guided by the fundamental principle that our students must be the primary beneficiaries of the university goals we define, as well as the initiatives supporting those goals. Within this framework, we sought to balance a complex variety of goals that address not only student success while at Texas State, but success after graduation. Goals also include promoting academic quality through new academic and educational programs; achieving significant progress in advancing our research and creative activities; and providing the necessary services, resources, and infrastructure needed to successfully move us forward. As with previous plans, we will conduct a formal review of the University Plan every three years through revisiting division, college, and department plans to determine what possible new initiatives may be included in the University Plan. During this time, departments, schools, colleges, and divisions will have the opportunity to reprioritize and add or delete goals and related initiatives to better address changing needs. Denise M. Trauth became president of Texas State University in 2002. Before joining Texas State, Dr. Trauth was provost and vice chancellor for academic affairs at the University of North Carolina at Charlotte. She earned a bachelor’s degree in English at the College of Mount St. Joseph, a master’s degree in journalism at The Ohio State University, and a PhD in mass communications at The University of Iowa. She is married to Dr. John Huffman, professor emeritus at Bowling Green State University and UNC Charlotte. They have two daughters, four grandchildren, and two great-grandchildren. Under Dr. Trauth’s leadership, the university has experienced its largest construction program since being founded in 1899, became a federal Hispanic-Serving Institution, was designated a Texas Emerging Research University, has been reclassified as an “R2: Doctoral University – Higher Research Activity” under the Carnegie Classification system, and moved to the FBS subdivision of NCAA Division I.
Dr. Trauth currently is the President of the Greater San Marcos Partnership and is a member and former president of the Austin Area Research Organization. She serves on the Board of Trustees of the Southwest Research Institute, is a member of the Philosophical Society of Texas, and currently serves as the immediate Past President of the Sun Belt Conference Board of Directors. She also serves on the NCAA Board of Governors and is the NCAA Division I Board of Directors vice chair. Dr. Trauth has served on the American Council on Education’s Commission on Women in Higher Education and serves as the presidential sponsor of that organization’s Texas Network for Texas Women in Higher Education. Students have endless options to make their educational experience at Texas State one-of-a-kind. They can choose to incorporate undergraduate research, study abroad or Honors College courses into their degree plan.